Can a machine ever be creative enough to be considered a true artist? 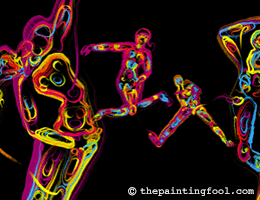 The Painting Fool is an intriguing concept. Basically it's a computer program which has been created to “exhibit behaviours that might be deemed as skilful, appreciative and imaginative”, and is being dubbed as an “aspiring artist”. The creators are hoping this programme will one day be taken seriously and considered a creative artist in it’s own right. Obviously this is going to generate a whole lot of debate, but the fact is that some people are taking the concept seriously. It's work has been exhibited, not just in online galleries, but in their real life counterparts. The theory that has lead to it’s creation draws from artificial intelligence, cognitive psychology, philosophy, and the arts. The ultimate goal is to construct a program or computer capable of human-level creativity, but could could also be used to enhance human creativity and be used to better understand creative behaviour in humans. But to counteract that statement you could pose this question: "is the creation of the program not similar to other artists who have used non-human means to create their art?"